For all the talk of Twitter fomenting change and connecting viewpoints through conversation, the social network’s best contribution to society is the platform it provides for the idiosyncratic weirdos of the world. One of Weird Twitter’s most reliably funny oddballs is Seinfeld2000, the pseudonymous Tweeter whose misspelled “Imagen Seinfeld was never canceled” plot synopses and clumsy Photoshop jobs have created an alternate Seinfeld universe—a sort of “bizarro Jerry,” you might say, if Seinfeld hadn’t already covered that ground itself. 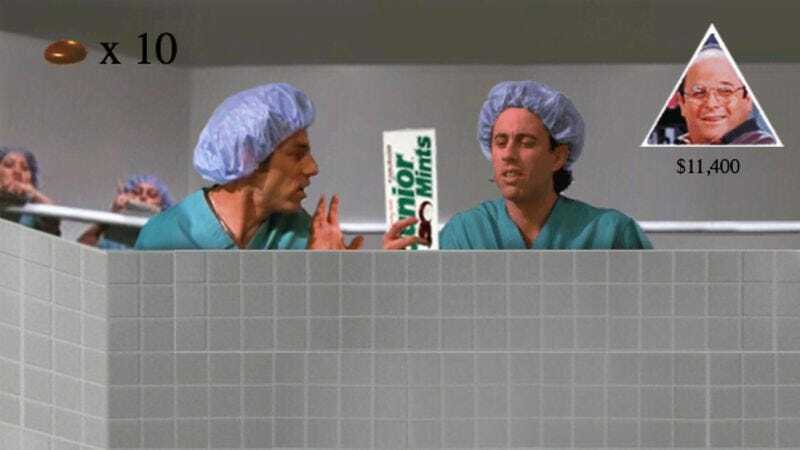 Now Seinfeld2000 has joined forces with the equally absurdist game developer Pippin Barr—and with Vampire Weekend’s somewhat more rational lead singer, Ezra Koenig—to create a browser game adaptation of the Seinfeld episode “The Junior Mint.” In the game, you play as either Jerry or Kramer, flinging delicious Junior Mints around an operating room in the hope of landing them in the patient’s abdominal cavity. Koenig’s participation is to sing the Seinfeld theme’s bass line, which plays on a loop while various surgeons, Elaine Benes clones, and other characters mill about the O.R. floor. Miley Cyrus sometimes shows up, too. So, yes, it’s strange, and worth a quick play.